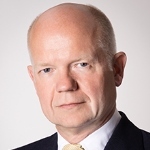 The Rt Hon William Hague MP is a former secretary of state, foreign secretary and a former leader of the Conservative party. Hague represented Richmond, North Yorkshire as an MP for 26 years, until stepping down at the 2015 election. His current interests include recent appointments to the Boards of Intercontinental Exchange, Inc and ICE Futures Europe. Born in Rotherham, Yorkshire, Hague first came to the attention of the British press and public at the age of 16, when speaking at the 1977 Annual National Conference, warning of the legacy of a Labour government should they win a general election. Hague entered parliament in 1989 via a by-election and became the Conservative party leader following John Major’s defeat in 1997. Hague stood down as party leader following the Conservative’s general election defeat in the 2001, as Tony Blair’s Labour party ensured Hague would be the first Conservative party leader not to achieve office since the role’s creation. He went on to hold prominent positions in David Cameron’s government and is soon to be elevated as a Life Peer in the House of Lords. Presented in association with JLA.